Studies consistently show that people who eat more fruits and vegetables are less likely to break a hip. 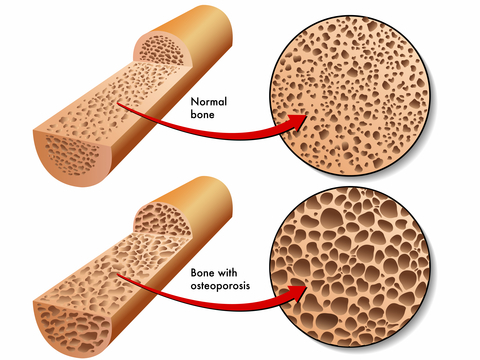 Osteoporosis in men is much more common. Osteoporosis in men is much more common—and more deadly—than most people recognize. Twenty to thirty percent of the more than 340,000 Americans who suffer a broken hip each year are men. Male hip fracture patients are generally 2 to 4 years younger than female patients, less healthy, and more likely to be African American. The most frightening consequence of breaking a hip is death, and men have been found to be twice as likely as women to die within the first 2 years after hip fracture. The risk is especially high during the first year, when men are more likely to succumb to deadly infectious diseases such as pneumonia. Confusion, pressure sores, congestive heart failure, and kidney failure are also more common in men after standard surgery for a broken hip. For those men that do survive, problems walking and participating in activities of daily living are more common than in women. In general, fruits and vegetables are the most nutrient-dense foods on the planet, and studies consistently show that people who eat more fruits and vegetables are less likely to break a hip. Fruits and vegetables are densely packed not only with bone-building vitamins and minerals, but also with antioxidants and phytochemicals that have special abilities to prevent bone breakdown. Vegetables high in the group of phytochemicals known as carotenoids appear particularly good at warding off hip fractures. [2,3] Carotenoids are the yellow, orange, and red pigments synthesized by plants, such as beta-carotene, lutein, zeaxanthin, and lycopene. Carotenoids appear especially beneficial for helping to prevent hip fractures in men. In one large observational study, 63,257 men and women aged 45-74 years were followed for 10 years. Among the men, lower hip fracture risk was significantly associated with consumption of vegetables, total dietary carotenoids, and specific carotenoids: alpha-carotene, beta-carotene and lutein/zeaxanthin. Men whose diets were in the top 25% for nutrient density, indicating a high fruit and vegetable intake, had a 26-39% lower risk of breaking a hip. In a separate large observational study, both men and women with higher lycopene intake had lower risk of hip fracture. Milk, on the other hand, does not appear to lower men’s (or women’s) risk of breaking a hip despite being heavily promoted for this purpose. Even though milk contains calcium, phosphorus, and protein and is fortified with vitamin D in the United States, and even though all these ingredients may improve bone health, studies show there is no association between milk intake and hip fracture risk. People in countries like the United States with a high calcium intake from milk and milk products actually have a high incidence of hip fracture. A meta-analysis published in the Journal of Bone Mineral Research examined 6 studies involving 195,102 women and 3 studies involving 75,149 men and found no association between milk intake and risk of hip fracture in women and concluded more data were needed for men. Much of the pain, disability, and death associated with osteoporosis in men can be avoided. While milk doesn’t seem to be a part of the answer, fruits and vegetables do! Men, you can help yourselves avoid a broken hip by eating more carotenoid-filled foods. Carrots, cooked tomatoes, pumpkin, sweet potato, winter squash, and cooked greens like spinach and kale are some of the best sources of carotenoids. Try to include at least one of these foods in your diet every day. There are many more natural remedies for improving bone health and preventing fractures. J Bone Miner Res. 2013 Jul 16. J Bone Miner Res. 2009 Jun;24(6):1086-94. J Bone Miner Res. 2011 Apr;26(4):833-9. Originally published in August 2015 and updated. antioxidants, beta carotene, bone, bone building, bone health, broken hip, calcium, carotenoids, carrots, congestive heart failure, diet, food, health, heart failure, hip fracture, kale, kidney failure, lycopene, male osteoporosis, milk, natural remedies, natural remedies for, nutrient dense foods, nutrient density, osteoporosis, osteoporosis in men, pain, pneumonia, protein, spinach, studies show, vegetables, vitamin, vitamin d, vitamins, vitamins and minerals, zeaxanthin. Another reason to ditch the milk: Non-organic milk is often laden with hormones, antibiotics, and environmental pollutants. Leave the dairy to the baby cows! Hi to every one, for the reason that I am in fact eager of reading this website’s post to be updated on a regular basis. It includes nice information.